That was ugly. No mincing words here, as the Patriots (hopefully) got their annual stinker out of the way already in a 16-0 shutout at the hands of Buffalo. The game didn't even seem that close given how poorly they played in all three phases and how many physical and mental errors they made over the course of the game. Sadly, Buffalo was much more physical and emotional than the Patriots were as well, which is alarming considering the fight they started before the game. Not surprisingly, Professor Melia is not being very generous with his grades today, folks. Quarterback: D. Jacoby Brissett got the start after it was learned hours before the game that Jimmy Garoppolo would not be ready to go. Brissett struggled from the start with accuracy and decision making. His ill-advised decision to go chest to chest with Zach Brown after he scrambled out of the pocket on 3rd down led to a fumble. So instead of 13-3 at halftime it was 13-0. Brissett also looked nervous and jumpy on the few read option plays they ran and Buffalo easily sniffed the plays out, resulting in several negative plays. Brissett also threw into double coverage several times and overthrew Danny Amendola on a 3rd and 19 from the Patriots' 44 some 30 yards down the field, which would have resulted in a first down and put the team in field goal range for the second straight drive. This transpired immediately after Buffalo gave them momentum once again after Dan Carpenter hooked a 47 yard attempt off the left upright. Another opportunity lost. Not to be too critical of the rookie, but Brissett so far appears not go through his progressions well on passing plays but instead has a tendency to either run or to leave the pocket early, thereby exposing himself to blindside hits, as his lineman cannot see his movements behind them. Running backs: C+. Media whipping boy LeGarrette Blount actually had some hard runs, especially in the 2nd half. Penalties and negative plays on early downs forced the team to get away from its power running game until the second half. Blount rushed only 4 times in the second half, but barreled his way for 29 yards. A few of these attempts resembled some of the powerful runs in the first three games where he exploded through the hole and knocked would-be tacklers backward for more yards. James White had 62 yards on 9 touches. Sadly, this output was the second highest yardage total by anyone on the team. Brandon Bolden dropped a potential 30-yard-TD pass from Brissett on the Patriots first drive of the third quarter, which would've cut the score to 13-6. Yet another opportunity lost. Receivers: C. Chris Hogan set the tone for the game by both holding and setting an illegal pick on the first play from scrimmage, which negated a 90 yard gain to Buffalo's 1 yard line. Hogan also let one slip through his hands in the end zone on a 25-yard pass from Brissett late in the 4th quarter, which would have cut the score to 16-6. The ball was thrown high but Hogan mistimed his jump. Final opportunity lost. Julian Edelman had his worst game in my memory with 2-pre-snap penalties (illegal shift and false start), as well as 2 poor Wildcat plays resulting in a 1-yard keeper gain on the first (and no horsecollar called on Zach Brown, inexplicably. With that being said, this game was very-poorly officiated with bad calls against both sides, as well as several non-calls on late/illegal hits against Buffalo). The saving grace was that, once again, Martellus Bennett had a great game with 5 catches for 109 yards. Rob Gronkowski finally got on the board for 2016 with his first catch (on 2 targets). Offensive Line: D-. On the play right before the Brissett fumble, the Patriots seemingly picked up a first down on a 1-yard Blount run, but the play was negated by a holding call on David Andrews. Joe Thuney got flagged for a false start in the first quarter, thereby making the Bills lives even easier. Whipping boy Marcus Cannon was beaten for a sack and also had a hold on a Blount 4-yard run. 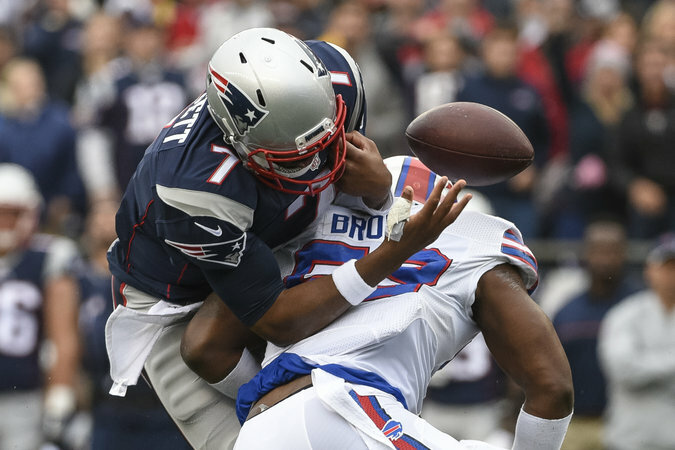 Nate Solder was flagged for holding, but Buffalo chose to decline the penalty after they sacked Brissett. We'll give Solder a pass on the ridiculous chop block that was called against him when he fell down in front of a defender. One would hope that the NFL will put referee Peter Morelli out to pasture, but then again, the league office probably enjoyed seeing the Patriots get screwed on some calls in order to justify their ridiculous-deflategate punishment. Defensive Line: C-. This group was repeatedly beaten at the point of attack as the Bills used effective overloads and seal blocks to turnstyle Patriot lineman. Vincent Valentine and Malcolm Brown were sealed off on a few Buffalo runs, which occured mostly on Wildcat and counter plays. Alan Branch made a few nice run stops and added a sack but it wasn't enough. Chris Long and Jabaal Sheard had occasional pressure, with Sheard adding a sack. A disappointing play occured when Sheard allowed Tyrod Taylor out of his grasp on a "would have been" sack but instead allowed him to escape the pocket and hit a receiver down field for a key first down. Linebackers: D. Poor tackling and lousy-gap discipline was the story of the day for this group. Dont'a Hightower returned to the field and had a forgettable performance. His neutral zone infraction on Buffalo's first drive negated an illegal-use-of-the hands penalty on tackle Cordy Glenn, which would've possibly killed their first drive. Jonathan Freeny reverted back to his 2015 form by showing he's weak against the run, as he was consistently blocked (often trailing the play) or was caught up in the wash. Jamie Collins has an OK day, but didn't make any special plays like he did against Houston. Secondary: D. So far in 2016, this group has been the team's biggest disappointment by far. They were victim time and again to incuts and slants and were often late to the ball. Logan Ryan looked slow in his reaction time on several plays. Justin Coleman looked like his typical self with less-than-adequate coverage. He also added an illegal contact penalty and a holding call, both of which occurred on 3rd down. Patriot nation is still waiting for Malcolm Butler to make a big play after 4 games. The safety group never got beat deep but they were also victim to some poor tackling like the rest of the defense, which allowed Buffalo to move the chains with ease on the ground and with yards after the catch. Special Teams: D. After the Patriots defense forced a quick 3-and-out, Stephen Gostkowski missed his second kick of the season after the team ground out a 46-yard drive to set up a 48-yard attempt, which sailed wide right. All of the momentum gained at halftime was lost at that moment. Cyrus Jones had a game to forget with two boneheaded returns out of the end zone, which started the team at the 9 and 14 yard lines. He also muffed a fair catch on a punt, which almost led to a turnover. Danny Amendola also fumbled a punt, which he also recovered. Ryan Allen, once again, was excellent and one of the few Patriot players that played well last Sunday. The Patriots chose not to call it's pooch-kickoff play on its only kickoff of the game to open the second half. Coaches: D. Unlike many media critics, I refuse to say that Josh McDaniels should have "opened the playbook" for Brissett. Clearly, the rookie QB was overwhelmed as it was with the materials he already had in his bandaged hand. Buffalo crowded the line of scrimmage and disguised blitzers and Brissett at times had trouble recognizing the defense. This is not a criticism of the quarterback, but rather the reality for a player with only 6+ quarters of real NFL action under his belt going into this game. The coaching issue took place on defense, mostly, where the team failed to properly alter its game plan and halt the Bills until after halftime. Find more of my work here and follow me on twitter @TheSeanMelia.